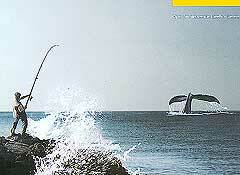 More than half of all advertisements with Whales show them jumping out of the water. Most often it's a jump towards a better life, to more freedom but without the notion of escape which is typical for Goldfish. 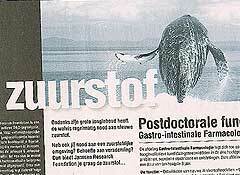 In the few other adverts the characteristic flukes are shown. Here the writer tries to make a link with an unspoiled environment that must be preserved. 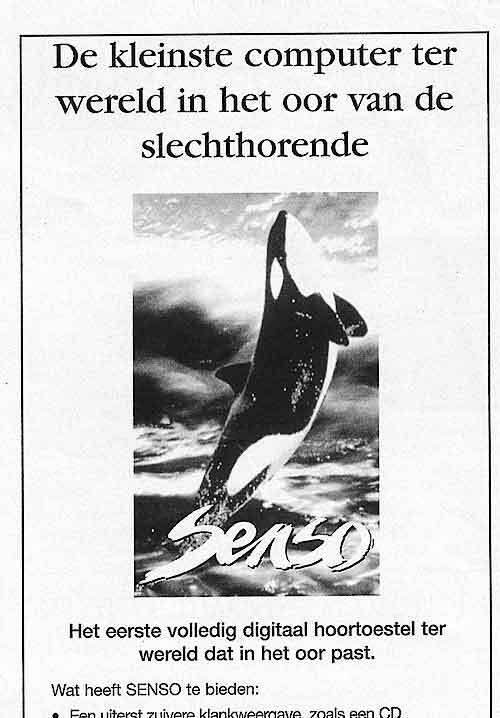 The first two examples of advertisements with whales are also the best, I think. They both are for the same brand and stand 15 years apart. 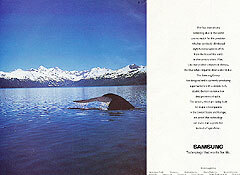 Both adverts feature a nice unspoiled seascape with a whale centerstaged, but the focus is slightly different. 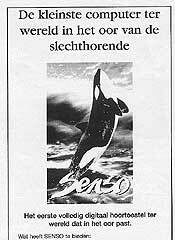 Advert 1 is about the seas while advert 2 is talking about preserving the world in general. 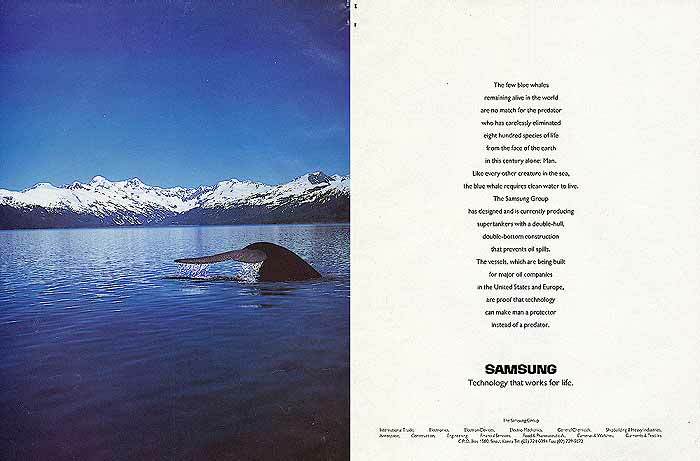 (1) 1991 - Technology that works for life (2) 2006 - Sometimes contributing to the world means leaving it just as it is. I'm rather pleased with the copy because it's very straightforward and not with all the fluff trying to hide that the company has no opinion. The few lines (nr 1) do tell exactly how mankind behaves: The few blue whales remaining alive in the world are no match for the predator who has carelessly eliminated eight hundred species of life from the face of the earth in this century alone: Man. 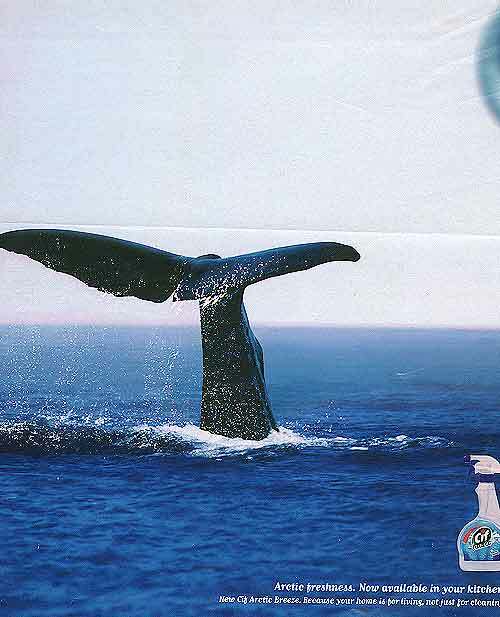 Like every other creature in the sea, the blue whale requires clean water to live. 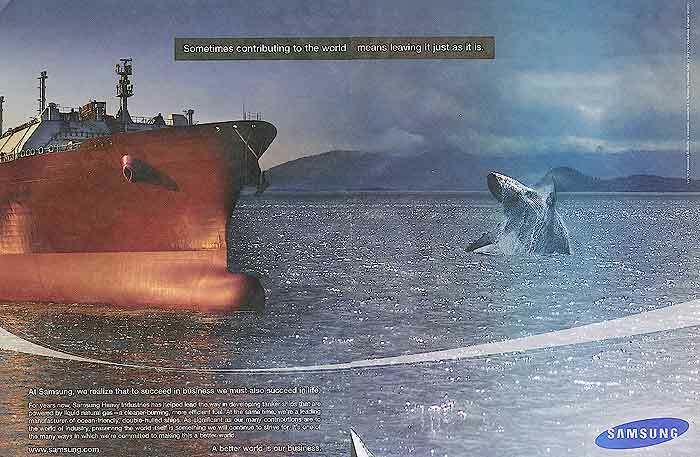 At the time the disastre with the Exxon Valdez (March 1989) was still burnt on our retinas and that probably explains the focus of this advert: the company is producing supertankers with a double-hull, double-bottom construction that prevents oil spills. The seascape stands for the oceans. 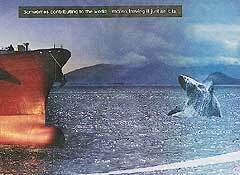 Exxon Valdez has sunk to the bottom of our memories and global warming and the influence of man on the world's climate has come to the foreground. This change is reflected in advert 2. The language also is tuned into modern times: we are submerged in a cocktail of slogans without real content: Sometimes contributing to the world means leaving it just as it is. or ... to succeed in business we must also succeed in life. or A better world is our business and some more. Just one titbit stands out: the company is ... developing tanker ships that are powered by liquid natural gas - a cleaner-burning, more efficient fuel ... . The seascape here stands for the whole world. For a better life (ad 4) is difficult to interpret. 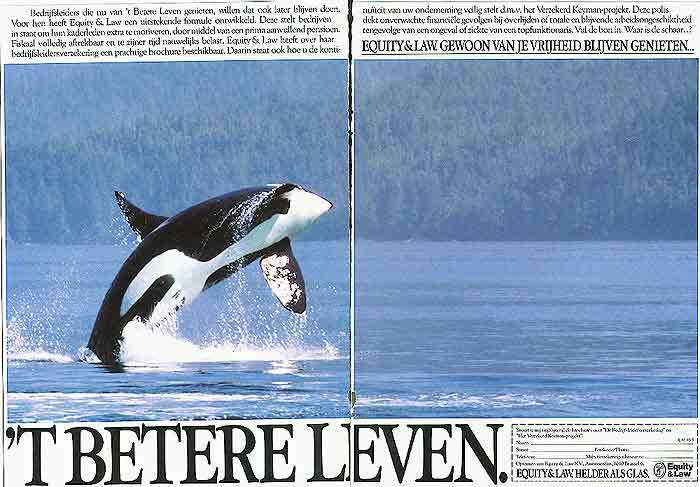 Is the Killer whale shown to represent the dangers of life against which you need protection (see also Sharks)? Probably only the happiness expressed by the jump is important. Today you are enjoying a care-free life; keep it that way; think ahead. Any species radiating happiness would do. 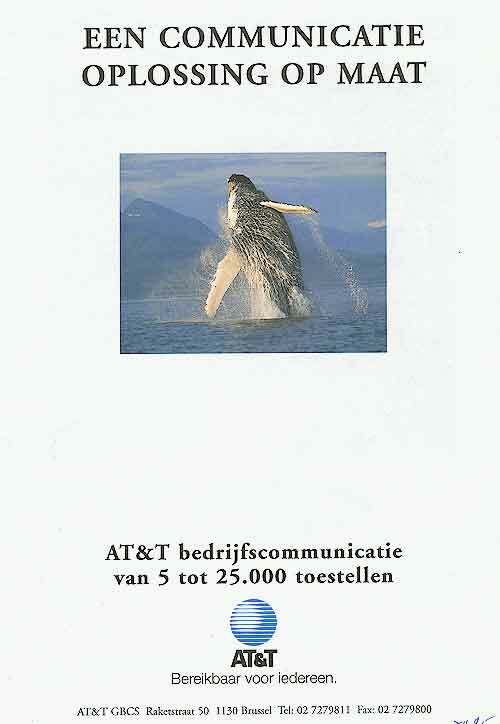 The telecom advertisement is a mystery (ad 5). You'll get a solution tailored to your needs. Why the Humpback? 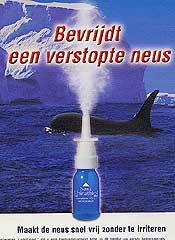 And why the Killer whale for a hearing aid so small that it fits into your ear (ad 9)? Perhaps because this new small device will bring you a happier life (cfr ad 4)? Any advertisement is improved by a pinch of wit. It's a secret of the trade. 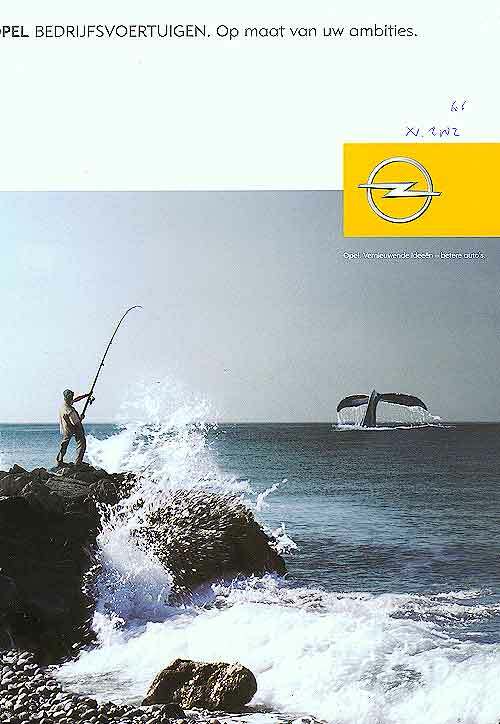 When dreams become reality , says advert 6 about utility vehicles and alludes to fishing stories. 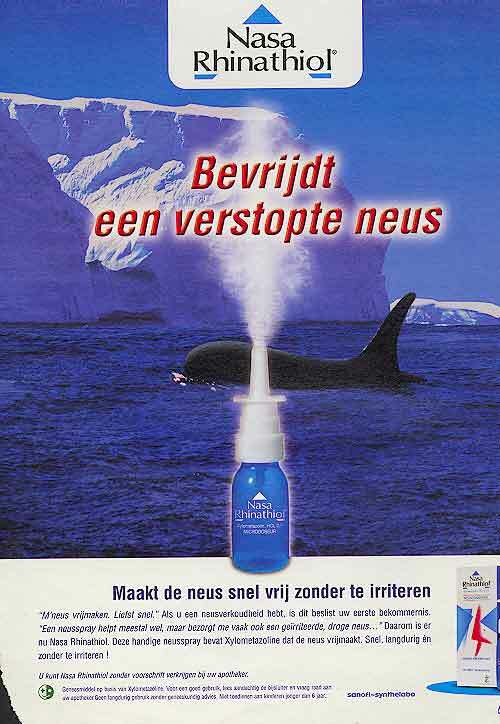 The product of advertisement 8 uncloggs your nose and the blow of a whale is indeed evidence of a nose in good shape. It's disappointing that the photo editing was a bit amateurish. The cleaning product for the kitchen relates to the clean air in polar regions ( Arctic freshness - ad 7). The fluke stands for the arctic. 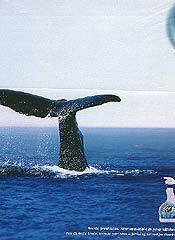 Whales are by no means restricted to the Arctic, not even to the polar regions. 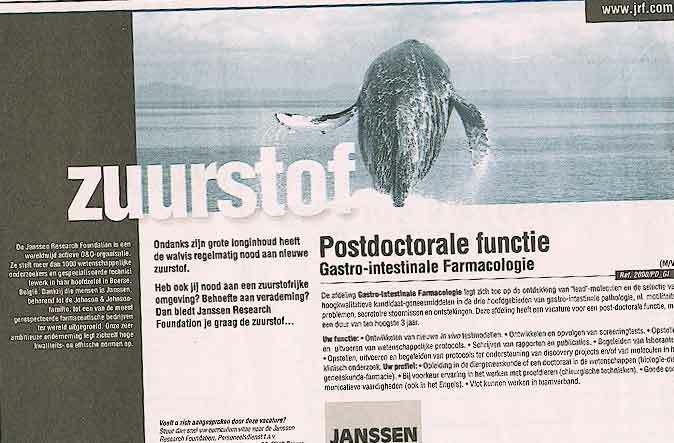 The copy-writer should have known that. 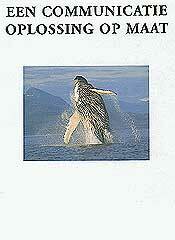 Whales can be seen in (coastal) regions the world over. 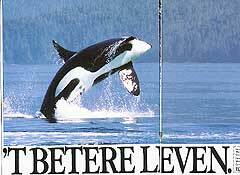 Cetaceans, if you ask a zoologist, count several families like Right and Gray Whales, Rorqual Whales, Sperm Whales, Blackfisch, Oceanic Dolphins and several more against which my distinction in Bigger and Smaller may seem futile and inadequate. But if you look at the way copywriters handle them, then grouping Cetaceans in bigger (or whales) and smaller (mostly dolphins) species and forgetting about teeth and baleens and flukes etc. is probably the best approach.